This is the kind of dish you might be embarrassed to serve to company. You could probably fancy it up by using some kind of artisan bread, and going with seared ahi or tuna steaks or something with better foodie cred than canned tuna. But when you’re not worried about impressing anyone, this is comfort food that will take you straight back to your childhood. And in honor of childhood, this recpie is being submitted for the Food for Plastic Challenge III. Tupperware will be donating some of the sales to the Boys & Girls Clubs. Head on over and vote for this if you like it. 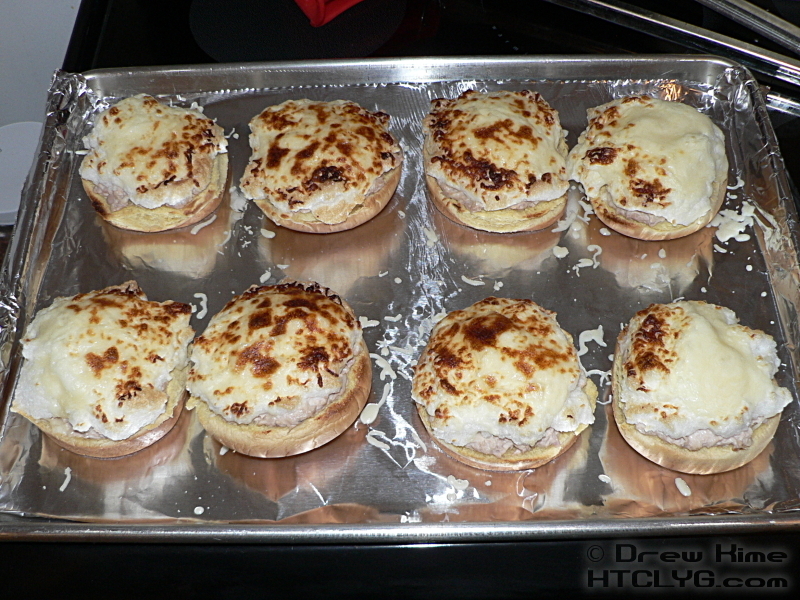 Before starting, turn the oven on to 450°, and set the rack at least 9-12 inches from the top. 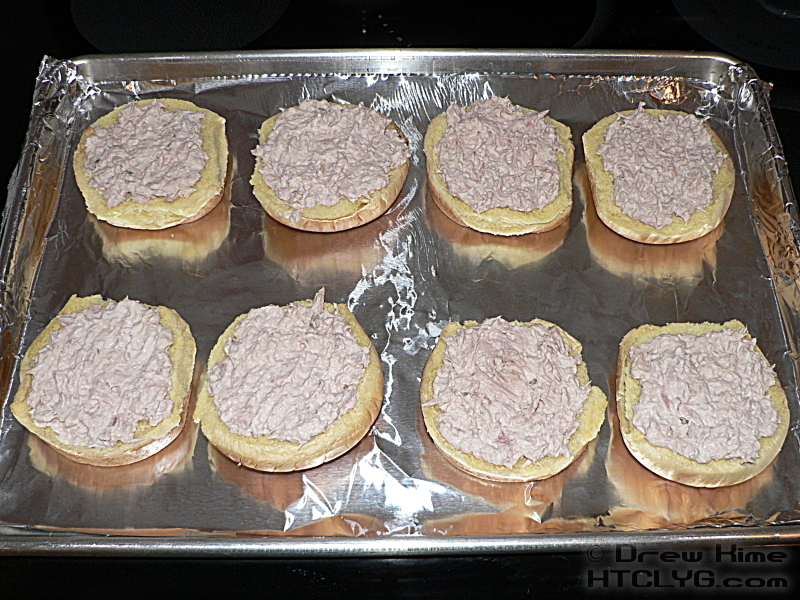 Open the tuna and drain well. 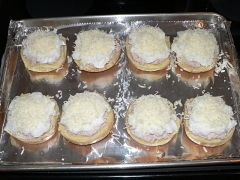 Set the tuna aside and separate the two eggs. No, this does not mean put one egg on the left side of the table and the other egg on the right side of the table. (Smart alec.) It means separate the white from the yolk. 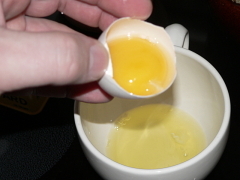 You’re supposed to crack the egg into the separator, and the white will drain out through the hole while the yolk stays behind. But I can’t figure out which hand to hold it with while I’m using both of mine to crack the eggs. 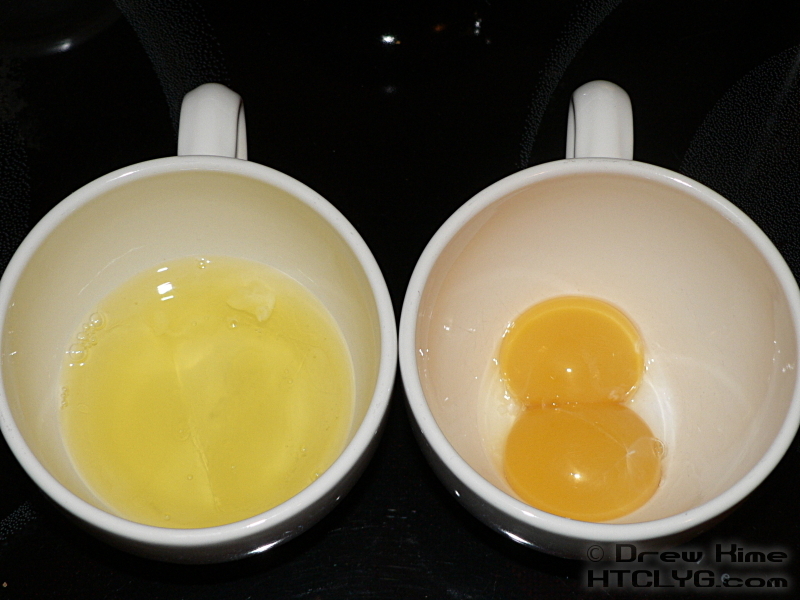 I think you’re supposed to crack the eggs one at a time into a cup, then pour it into the separator thing. 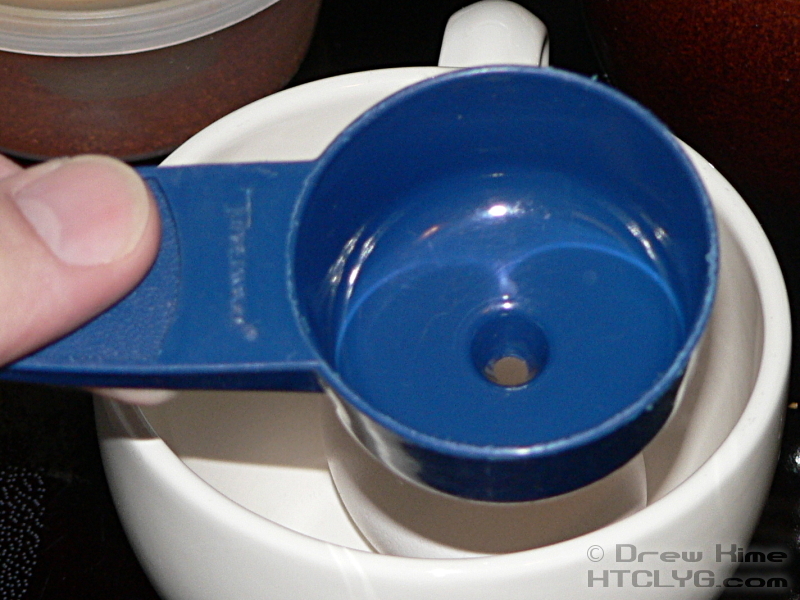 But if you do that, you end up with an extra cup — and the separator — to wash when you’re done. That’s why I do it the way I learned growing up. Crack the egg in half, then pour the yolk back and forth between the two halves, letting the white run over the edge. Do this for both eggs and you should have about a quarter-cup of egg whites and two yolks. If you want to really go all out, take the two yolks and make your own mayonnaise. If not, either give the yolks to your dog or dump them down the drain. 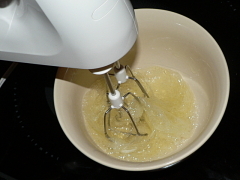 Eggs are about a dollar a dozen, you can afford to dump out two yolks. 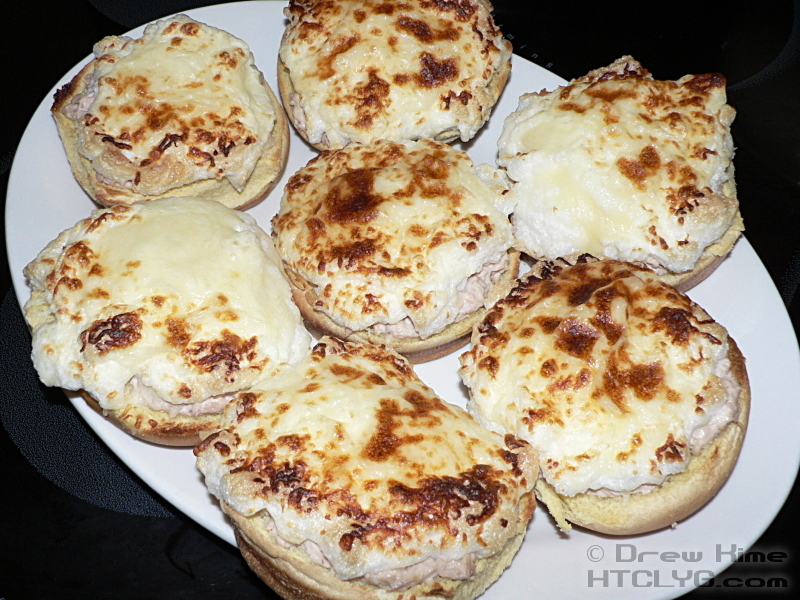 Mix as much mayonnaise as you like into the drained tuna. Some people like it nearly dry, some like it soupy. 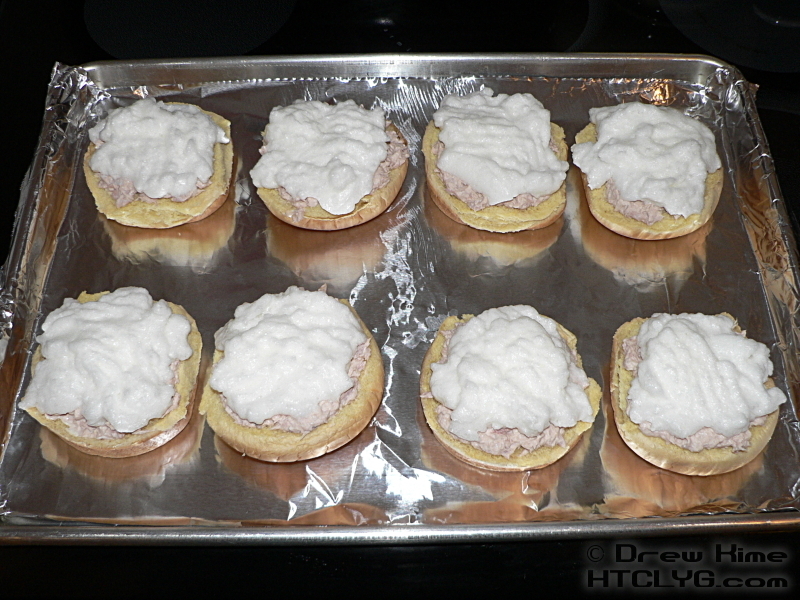 If you’ve never made tuna fish and you’re not sure exactly how much mayo you need for two cans, just mix in one spoonful at a time until it looks right. 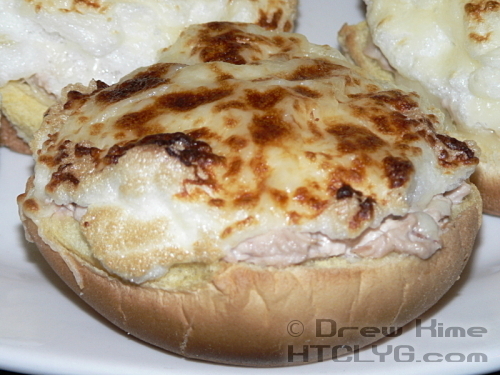 Although if you’ve really never even made tuna fish, I don’t know that you should be playing with the oven. Now we’re going to turn the whites into a meringue. That just means whip it until it gets light and fluffy. 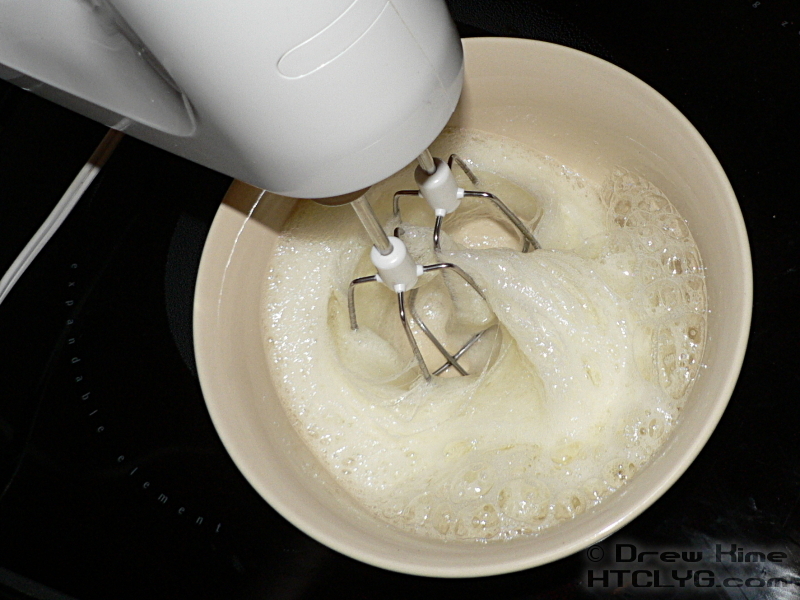 Put the whites in a large bowl and go at it with a beater. If you’re going fast enough, you should see them starting to foam up almost immediately. Keep going until you have a bowl full of white fluff. Now you’re ready for assembly. 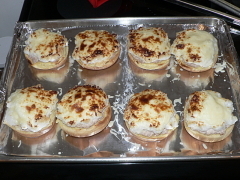 Line a baking sheet with aluminum foil. (It doesn’t make a difference to the food, it just makes cleanup easier.) 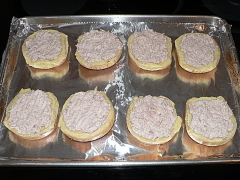 Lay out the hamburger buns, and divide the tuna evenly among them. 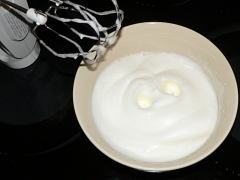 Top each one with a spoonful of the whipped egg. Then a little of the mozzarella. Now switch the oven to the broiler setting and put the pan in. Don’t worry if it hasn’t finished pre-heating yet, you just want it to not be cold when you start cooking. Don’t walk away. The cheese will start to bubble in less than a minute. 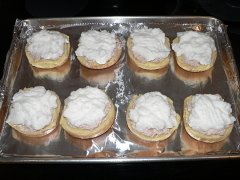 You’ll get a really good idea of where the hot spots are in your burners by looking at the tops of the tuna puffs when you pull them out. 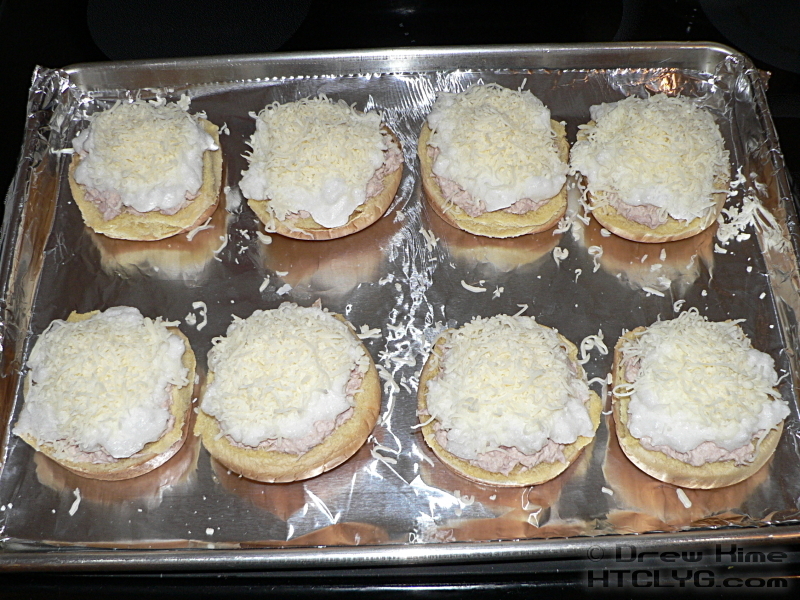 If you want them to be evenly finished, swap them around on the pan to put the less-finished ones under the hotspots. As long as you don’t have any completely raw, though, you can plate them up with a little variety in done-ness. Let the kids pick which ones they think are “better” and you take the rest. Really, though, they’ll all be good.